A couple of weeks ago, a well known "sanctuary" was raided for unspeakable cruelty. A mass grave was found where 38 pit bulls were allowed to die from heat. Employees were on facebook prior to the raid making fun of dogs at this place of horrors. Yet, this is a place highly recommended by the No Killers and dogs from Southern California ended up there. This is a lesson in how this scheme called "No Kill" works. Pull the pits from the shelters, do a chip in that brings in loads of money, and then dump the money maker off in a "sanctuary", with no intentions of ever getting it back again. It served it's purpose to make money for the "pulling" rescue. Spindletop is also another example of the connection between breeders and "No Kill". Leah Purcell was a pit bull breeder, had been all her life. 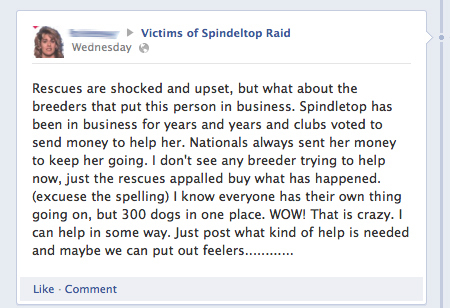 Not only did she collect money from "No Kill", she was collecting from the pit bull breeding community as well. How many of these pits went to fighting? How many went to breeding? 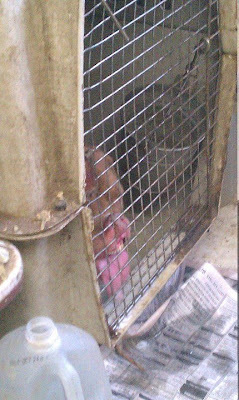 The raid, of course, did not victimize but saved the pit bulls and lesser dogs from their miserable living conditions. It was Leah Purcell, owner of Spindletop Refuge in Willis, TX, all of pit bull advocacy, all of no kill advocacy and all their collective blind eyes that victimized over 300 dogs, most of them pit bulls. Many if not most of her dogs were sent to her by a shelter or rescue that raised the $750 fee in order to sent an unadoptable, often dog aggressive dog to Purcell. 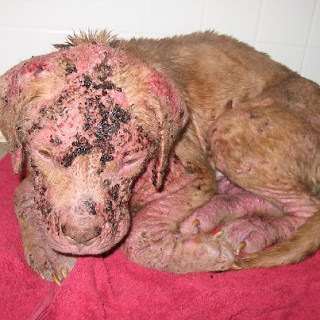 This is a fine example of how the "Savior" rescues left poor pits at this place and didn't even care enough to check on them. That cage is his home and that liquid on the newspaper is a copious amount of drool. The caretaker Purcell hired to tend the dogs, not noticing or caring that the dog was in great distress, put this photo on his facebook page with the caption: "LOL at Justice the drooling pit bull." And that foster fur mommy, who had passed the buck on Justice, desperately wanted the poor precious dog-aggressive baby Justice back. To put all this time and money spent on unadoptable pit bulls in perspective, think about the accepted estimate of one million pit bulls killed each year. That's 2,739 pit bulls killed every day. 114 killed every hour. Two pit bull are killed every single minute of every single day in the US. And many of those dogs are healthy and not known to be aggressive. 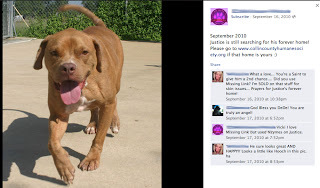 From the first time Justice was rescued in March 2010 until the time that he was re-re-re-rescued in July 2012, about 2,246,575 pit bulls had been euthanized. The rescue angel has vowed to build cage for him, so that she can keep him herself. Marissa is from Los Angeles. Did she pull any of the Devore dogs and abandon them at Spindletop? 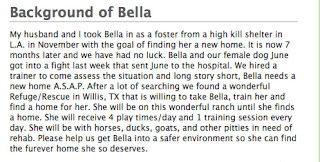 Marisa, who started the Victims of Spindletop Raid page, has a dog named Bella that she sent there after it put her other dog in a veterinary hospital. Paints a lovely picture doesn't it? Just like "No Kill" paints a lovely picture that is one big deception. This isn't saving lives. And those who support "No Kill" and all their scams? 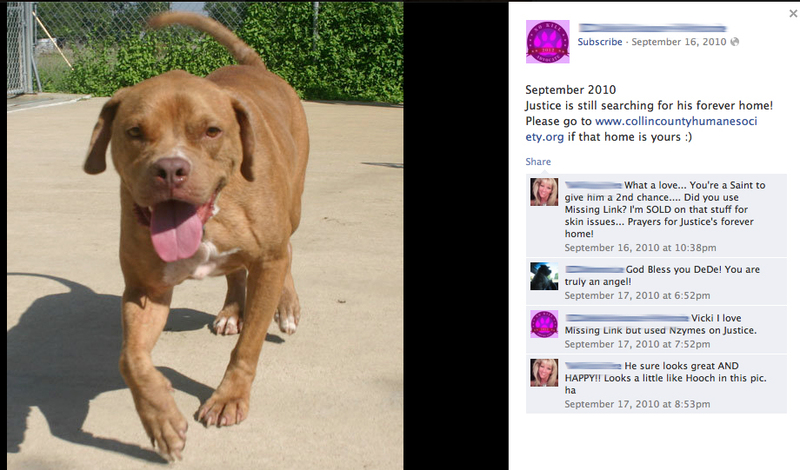 People like Linda Wilson Fuoco, a so called reporter who pimps the myths of pit bulls constantly. What is the results of this pimping? Purcell has been pumping dog-aggressive dogs into the Houston area since 1985. No doubt Purcell's efforts combined with a vibrant and dynamic Houston area dogfighting community have contributed greatly to a large and diverse and exponentially growing group of pit bull victims in the Houston area as well. And this one: The lawyer defending her now, Zandra Anderson, has been with Purcell as a friend, client and as a lawyer since her breeding days. Anderson bills herself as the Texas Dog Lawyer, but she is a breeder lobbyist and has successfully quashed legislation that would have protected dogs from puppy mill breeders. Anderson also founded the Texas Dog Commission to support anti-BSL lobbyists and her organization spearheaded opposition to BSL proposed in the wake of the death of Justin Clinton. "No Kill" is a scam and the Devore terrorists are nothing more than scammers for this movement. They aren't interested in the animals, only in their egos. They have their agenda and it is not saving shelter animals. All those dogs pulled from Devore and abandoned, how much money was gathered from chip ins for those dogs? Look at any of the facebook pages for these Devore terrorists and see how much money they are collecting on dogs still sitting in Devore. They are using Devore to line their pockets, just like Leah Purcell did. Linda Wilson Fuoco is an AKC breeder and lobbier. She has always propagandized for her AKC puppy mills business friends and all the dog fighters and the rest that lobby with the AKC. This has long been documented as she was exposed years ago. 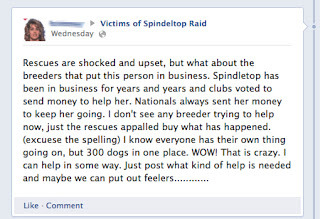 It was the Responsible Dog Owners of Texas (breeders with dog fighters and the others hovering around and stating on their sites they belong to it and it supports them) and other breeder groups like AKC kennel clubs that were propping up and funding and promoting Spindletop to keep killing the numbers they overbreed and try to keep it secret. They also enlist childish women and guys who believe their lies to help kill these dogs. Then they start lying that there is no overpopulation, as they support these dog concentration camp to hide the overpopulation. Anyone supporting nokill now is supporting these breeder criminals and their torture of animals. I really would like to get your sources of information.. Sounds like a lot of conspiracies at work here. I think I pretty well provide links to what I say. And yes there is a lot of conspiracies surrounding "No Kill". You have no idea of the scams and schemes being hatched in the mind of Nathan Winograd. Winograd's followers just refuse to see his connection with breeders. He's a front for commercial breeding. You never hear him condemning breeding. He thinks there is not a problem. 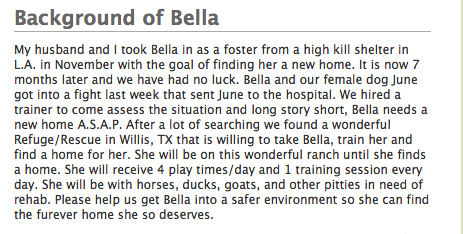 When 30-60% of your shelter population is purebred, deliberately bred, money in someone's pocket, there is a problem.